This may sound familiar: you’re going to Italy in two weeks. Or Greece. Or Vietnam. You’ve been planning this trip for months, but it just never seemed like the right time to sit down and learn how to say, "Excuse me, is there a Wi-Fi password?" or "I’m sorry, but I believe my napkin may be under your chair." Now you’re staring at a useless phrasebook that was probably published in the Bronze Age, and you realize with a sinking feeling—you have made a huge mistake. If this anecdote fills you with anxiety, don’t worry—we’ve got you covered! Free Library patrons have easy access to two online language-learning services: Mango Languages and Duolingo. We’ll have you speaking like a native in no time! For those who have more time available, Duolingo offers the opportunity to learn a language much more in-depth. If you struggle with commitment, time goals and experience points will help keep you on track. Are you already intermediate in a language? 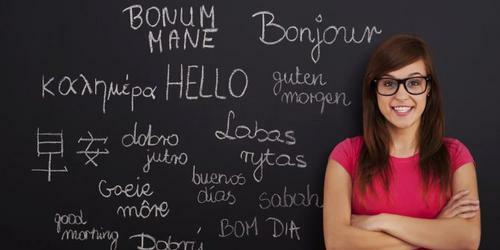 First-time users of Duolingo can take a placement test to begin at the appropriate level. Beginners start with basics courses before continuing on to more specific lessons. Fast learners can test out of a level if they find it inadequately challenging. Duolingo offers 32 languages, including Klingon and High Valyrian for the sci-fi/fantasy geeks. Real-time dialogues and comprehension questions help learners to practice their speaking and listening skills. Feeling unmotivated? Add friends through Facebook for accountability or join a "language group" with other students in your region. Having a hard time deciding which resource is right for you? We don’t blame you—at first glance, the two appear very similar. Both Mango and Duolingo have online discussion forums. Both are available on social media and love bringing new polyglots onto their team. The main differences are in the fundamental way in which they approach learning. Duolingo is ideal for a learner who likes to focus on tangible goals. If you enjoy logging time, tracking your progress, and accumulating points and skill sets, this gamified resource may be what you’re looking for. If your intention is to have fun, quickly prepare for real-world conversations, and explore another culture, Mango may be more your style. This resource will provide you with a deeper understanding of the background and significance of a language. If you still can’t make up your mind, try both! Free Library patrons have easy access to two online language-learning services: Mango Languages and Duolingo! Add a Comment to Learn a New Language with Mango Languages & Duolingo!